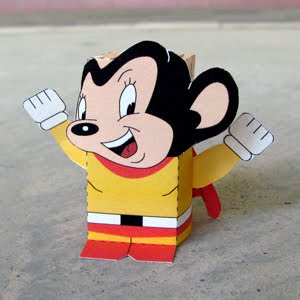 This paper toy is a cute cube Mighty Mouse, designed by Toy a Day. Mighty Mouse is an American animated anthropomorphic superhero mouse character created by the Terrytoons studio for 20th Century Fox. The character made its first appearance in 1942, and subsequently appeared in 80 theatrical films produced between 1942 and 1961. These films later appeared on American television from 1955 through 1967 on the CBS television network on Saturday mornings. The character went through two later revivals, once by Filmation Studios in 1979, and again in 1987 at the hands of animation director Ralph Bakshi, who had worked at the Terrytoons studio during his early career.